You’re familiar with traditional pasta carbonara, right? It’s pasta cooked in butter made with a thick egg and cheese sauce covered in bacon. So tasty but, unsurprisingly, really terrible for you. I’m always looking for ways to reboot classic recipes in health-conscious ways and carbonara was a great nominee. Because I’m on a doctor recommended low-fat diet right now (whine) I’m trying my best to find creative and healthy alternatives anyway. 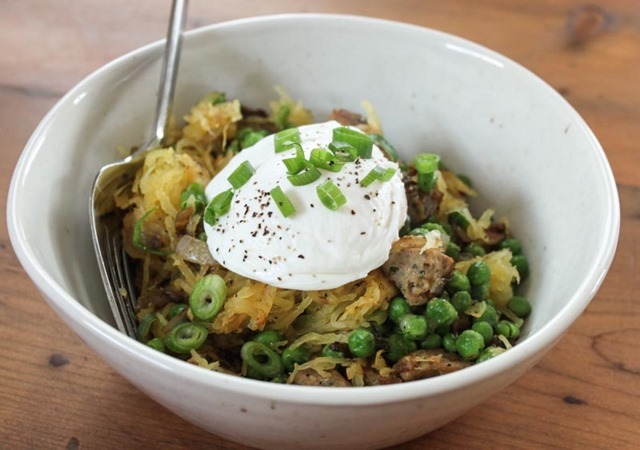 My newfound love of spaghetti squash as a healthy swap for pasta made this recipe an easy one to make super healthy. A lot of healthified recipes tend to still make you feel like you’re missing out on the real thing but this absolutely does not. 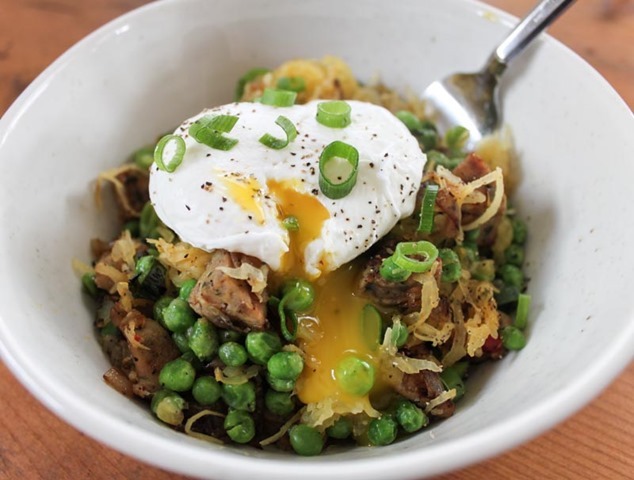 Another great thing about this recipe is that it’s a great make ahead – all of the individual components can be kept in the fridge and thrown together easily! 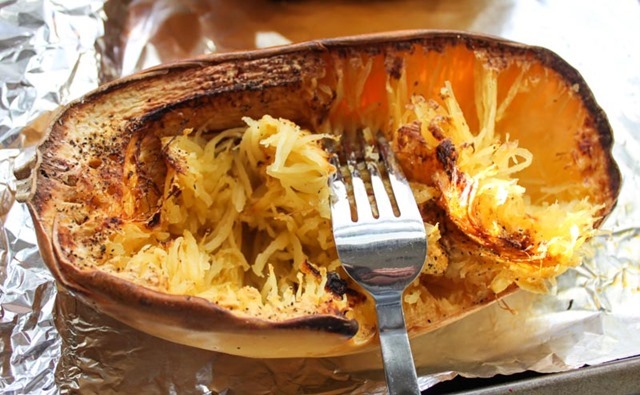 Roast a whole spaghetti squash according to these directions. 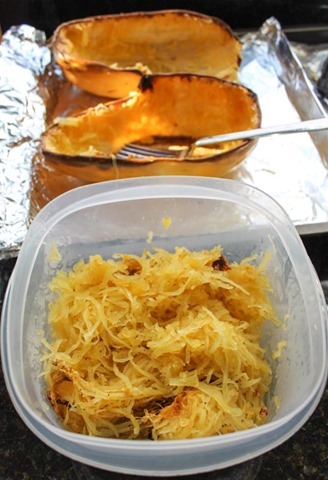 The roasted squash will keep in an airtight container in the fridge for up to one week. You’ll need one cup of squash for this recipe. To begin, poach one egg. I follow Smitten Kitchen’s instructions because they are completely foolproof and my eggs come out perfectly poached every single time. 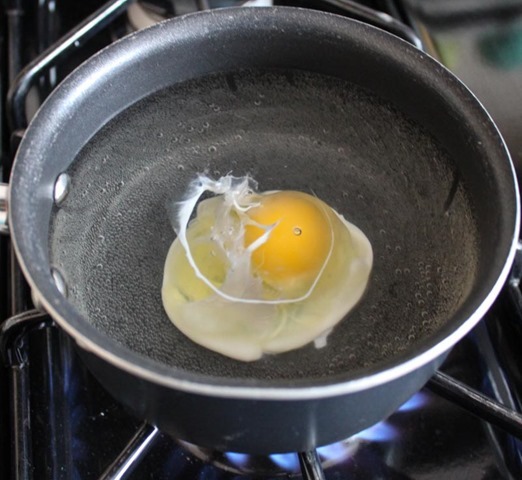 When the egg has poached (takes about 4-5 minutes), let it sit on a paper towel until you’re ready to plate up the carbonara. On to the main event! Heat a large saute pan over medium heat. 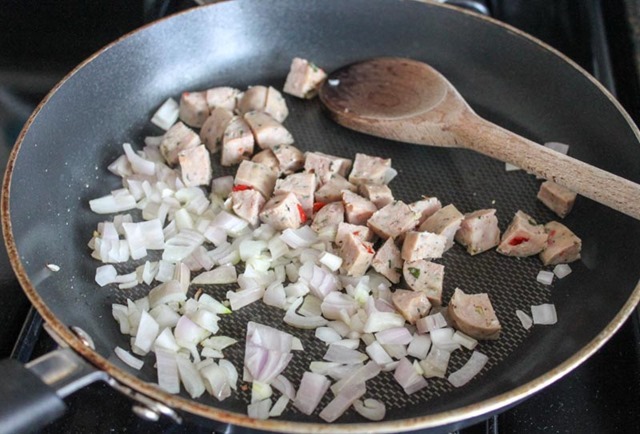 Saute the shallot, sausage cut into pieces, green onion, and olive oil until brown (1-2 minutes). 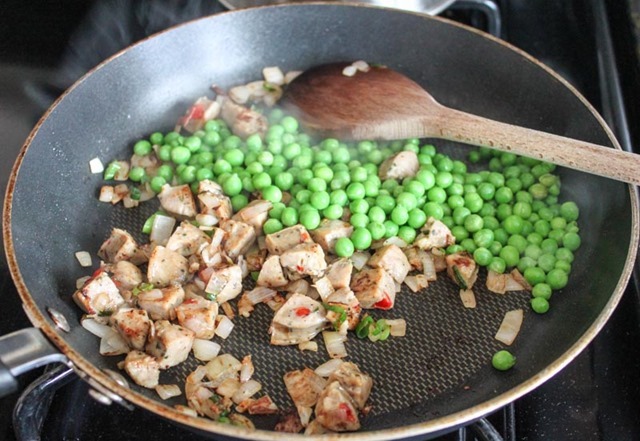 Add in the peas and stir to combine. 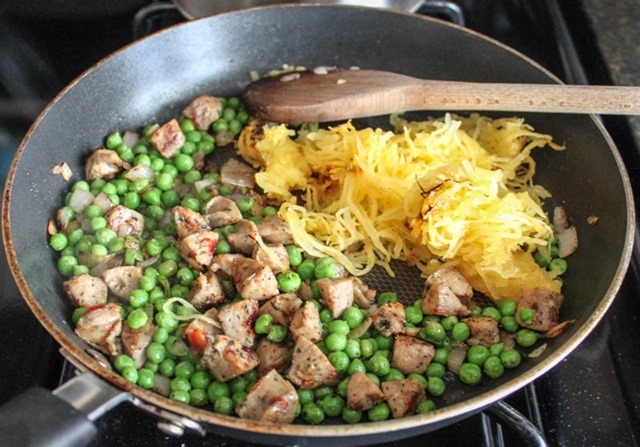 When the peas have been stirred in, add the spaghetti squash to the pan and cook until it is heated through (2-3 minutes). Toss to combine the entire mixture. With one minute of cook time left, sprinkle on the parm cheese and mix everything together. To serve, put the carbonara in a big bowl, top with the poached egg, and garnish with additional green onion and fresh cracked black pepper. 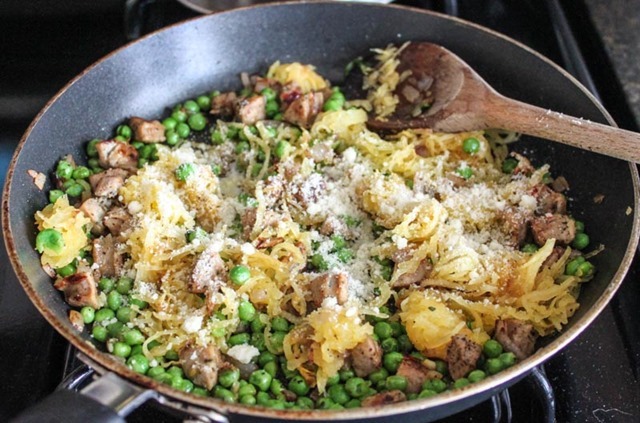 And now for the best part – break the poached egg yolk and let it run down into the carbonara. So good! I could not be happier with this dish. Not only is it healthy (only 500 calories per serving), it was a great alternative to the real deal. I will definitiely be making this recipe over and over again! I will definitely be making this this week. Thanks for the recipe!